Whether you're a renter or just really indecisive, a raised bed garden is a temporary and portable solution for green thumbs who can't or don't want to bury their plants in the ground. It's also cheaper and easier than a normal garden. You can purchase above ground planters from any gardening or hardware store. Alternately, you can make your own by nailing together untreated pieces of wood and attaching a chicken wire bottom. The size is entirely up to you, although you should keep it small enough to be portable but large enough that your chosen plants have room to grow. Do your research before you choose plants. Some types of vegetation does not grow well in planters. This website provides more information about different types of Australian plants. You could also talk to a specialist employee at a nursery. Once you've chosen your plants, find a sunny spot for your planters and layer the bottom with thick layers of wet newspaper or cardboard. Next, create layers of green material. You want about eight ten centimetre layers of any combination of green material like grass clippings, manure, straw, mulch, hay, compost or existing soil from the yard. Water each layer well before adding the next. You can start planting straight away, although you may want to wait a couple of days for the soil to settle. 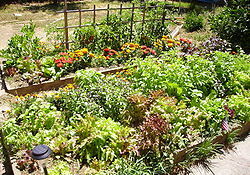 Plant your seedlings as you would with any other garden and cover with mulch, hay or woodchips to prevent weed growth. If you don't have a backyard, you can create a similar garden in a wheelbarrow or by placing plants in tea cups.